It has been a busy Easter weekend at Chez Crook - largely due to the decorating of one of the bedrooms. It was a straightforward enough job but as is the way with these things it was the preparation that took the time. It is now complete so all we are waiting on is the carpet and some furniture so that what passes for normality in our house can resume. As the weather was atrocious for the four days being inside was no great hardship! As a result of the above I was not able to get much done hobby-wise although yesterday made up for it and so I spent most of the day in the man cave. The packs referred to are the models produced by Historical Boardgaming for their Global Conflict series of games. This is a similar type of game to Axis and Allies and covers the period 1936 to 1945. there is a separate Spanish Civil War expansion and the company are currently play testing a version for 1861. I was also able to spend some time looking at the rules I have been working on for the WW2 naval set up and as a result I have changed a couple of things. The biggest change is that I have removed notional ship types from the rules. That's right, no more differences between cruisers, battleships and destroyers. This is not as extreme as it seems and the rationale is quite simple. If you recall I was basing ship statistics around a base number with better or worse vessels gaining or losing a point - the old DBM 'superior' or 'inferior' mechanism. I was working on the basis that a typical battleship would be rated at 4, a cruiser at 3 and a destroyer at 2. I must confess that I found this to be a little restrictive in practise and so I am now experimenting with a system whereby each category a ship is rated in - protection, main, secondary, AA, torpedoes and speed - is assigned the appropriate value from a range of 1 to 6. In reality this approach will mean that historical ship types will tend to polarise around certain values so the differences will be obvious. Once the order has arrived the plan is to tackle the RN and the Germans first, followed by the Italians although these have yet to be ordered. As a quick fix I may well give the Germans some extra opposition in the shape of the Soviet Navy for a change whilst I am organising the Italians. The big Pacific fleets will be tackled last of all as I need to get some additional ships as well as rather a lot of aircraft. 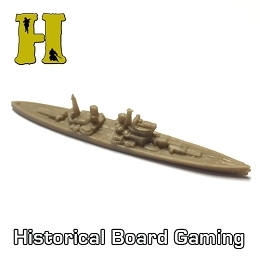 Can you list the hull length of the various ships from Historical Board Gaming? I certainly will as soon as they arrive. Based on the pictures I have seen they are similar to the Axis and Allies ,models at around 5 to 6 cms, possibly larger. They are also made from a softer plastic than the Axis and Allies ships but not polythene. Hopefully I will have them by the weekend and so can confirm definitively.